Jeff Mansfield is a AAA rated Teaching Professional and has been the Head Professional ClubFitter for the Llandilo Golf Driving Range since 2003. As a golf coach, he sees many swing faults in golfers that can be directly attributable to ill-fitting equipment. Jeff has built a strong reputation as a coach, teacher and fitter, and he understands that the golf swing is a combination of concept, human movement and equipment. Jeff’s acumen has led to a golf following both locally and internationally, and he is sought after as a lecturer and mentor to other industry professionals. Jeff is a trend setter. He was the first teacher in the country to bring in a launch monitor and he is proficient with Video Analysis, K-Vest and Putt Lab. He has been rated World’s Top 100 ClubFitter for the last six years (2013-2018). Jeff is also a member of IPAC, the prestigious association of the finest clubfitters around the globe, who have dedicated themselves to raising the bar for the profession, who strive for the highest standards of skill and integrity, and who help educate the public on where to go and what to expect in a real fitting. He is sought after by golfers of all skill levels, from beginners to touring professionals. 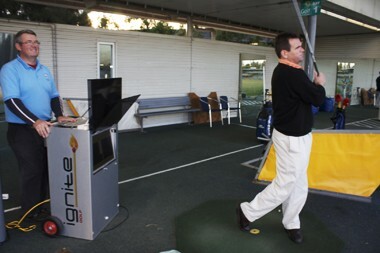 He was the Head Coach for the South West Sydney Academy of Sport and the Joint Head of Instruction for Absolute Golf. Jeff loves the game and nothing makes him happier than watching his students improve. When you are ready for a better game, give Jeff a call.